While much have been said about Apple's latest software iteration, iOS 11 concerning privacy; the new OS will give users more flexibility and power over apps that are try to impede their right to privacy, more specifically from accessing their location data. For instance, Apple now force Uber to bring back an option marked "While Using the App" under its location settings, and users will get it back even if they haven't updated to the latest software. 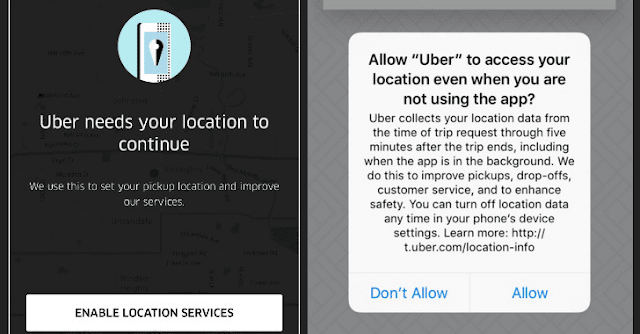 The Uber app, though has followed up on its promise to restore its users ability to block the app from tracking their location when they are not using it. But for iOS 11 users, that option to choose between "Always" and "Never" access to location data is even more enhanced as every app that asks for "Always" permission, also has to provide an option for "While Using" it. Albeit, Uber never actually implemented always-on location tracking for iOS, according to the company's security chief John Sullivan. The former gives the app permission to track location even when users are not using it, while the latter switches off location tracking altogether when not in use. Though, switching off tracking makes the app a lot hard to use, since it won't save the addresses of places they frequently visit. Still, by giving them the power to block it, users can ensure their own privacy.